2" bottom gusset w/ K seal, 1.25" header w/ tear notch, .51 PET PVDC saran coated, and laminated to 2.0 LLDPE. Moisture Barrier Zipper Pouches feature self-supporting bottom gussets and an airtight inter-locking zip system. 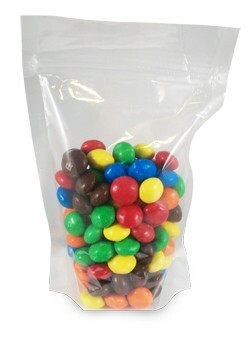 Saran coated bags provide for high barrier properties for both food and nonfood products. Hermetic seals and optional laser microperforations help ensure optimal freshness for produce applications. Bags are made of .53 gauge PVDC PET/2.00 mil LLDPE with a 1.5" bottom gusset.